Welcome to Hollow Hills where the secrets and lies are as thick as the fog that blankets the town. 17 year-old Jemma Blackburn knows vampires are real. She watched one murder her father eight months ago. They tried to convince her otherwise, tried to tell her she’d lost touch with reality due to the trauma, but she knows what she saw was real. And now they’re after her again. What she doesn’t know is that there’s a lot more to the seemingly coincidental bulls-eye on her back. These vampires—or Revenants as they’re called—are seeking her out for a reason. Because she’s Anakim; a powerful Descendant of Angels, and she isn’t the only one. That gorgeous guy who keeps showing up everywhere? He’s one too, and he’s got a secret that's about to turn her world upside down. 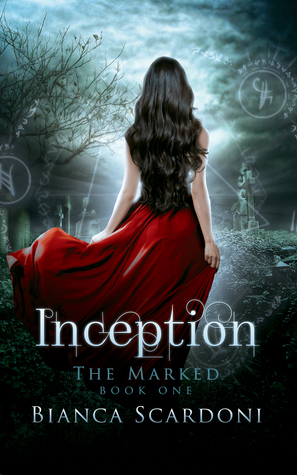 What she soon discovers will force her to come face to face with a far more sinister world than she ever knew existed. A secret caste of ethereal bloodlines, a love-triangle chock-full of lies and deceit, and an unrequited destiny that would place her in the perils of the very darkness she has worked so hard to outrun. Can she forge her own future and change that which has been fated? Or will she find that some things are inevitable, no matter where you go…or how fast you run. This book wasn't what I expected but I am happy to say that it was still very interesting and enjoyable! I really liked the storyline and the new take on vampires and angels. The friendship between some of the characters, the romance, and the whole mystery aspect of the story really pulled me in. I was definitely hooked to this story! And it was of course nice seeing the world of the Anakim! I also really loved Trace and Dominique, mostly because I found them to be the two most mysterious characters in this book. I thought I had Trace figured out but nope. I have no idea what to make of him now, especially after that ending! As for Dominique, I still have no idea if he really is the bad guy or the good guy, or the bad guy who isn't really all that bad. Lol. Either way, I am definitely looking forward to finding out more about them in the next book! Aside from these things, the writing and pacing was also great and for me this book was a fast read! However, I am sure you all must be wondering why I gave this book a 3.5 rating, even though I really liked the story. Honestly, I wanted to give this book a 4 rating, but there was just one thing in this book that kept bothering me and I couldn't really ignore. For me, even though I really liked the storyline, I just couldn't seem to connect with the main character, Jemma, in any way. Unfortunately, throughout the story she just seemed to come off as a little immature and whiny. I mean she was still a great character and everything, but I just couldn't seem to relate to her in any way, and that's usually a huge thing for me when reading a book. Also, I just didn't understand her actions/thoughts sometimes. Like at the beginning of the book, she was very firm in her belief that vampires existed and determined to prove it true, but when she is finally given confirmation that vampires are indeed real as well as introduced to the world of the Anakim, she just seemed to do a 180 and pretend none of it existed. Basically, I just had a really hard time connecting to Jemma and understanding her and that's the major reason why I am not giving this book 4 stars. I know this might seem like a small thing, but for me if I can't really relate to the character, then it just seems to take away from the overall story. But I will say that Jemma did seem to really grow throughout the last part of the book and the ending showed a different side of her, so I am looking forward to seeing how she is going to be in the next book! Overall, this was definitely a very interesting story and I really enjoyed reading this book! But be warned that there's a huge cliffhanger at end that will leave you running to read the next book. I honestly did not see that twist coming at the end, but now I am really curious and I can't wait to see what happens next!